Today’s business demands well tested software applications and products on all available browser versions, across heterogeneous devices, with different operating systems. It is no more possible to have limited/choice of combinations that you can claim to offer and support. Also, the emergence of Responsive web applications demands the same user experience in every possible combination. A mobile application to be certified for iOS, and Android on just 2 devices has to be tested on at least a set of 35 combinations across 5 different browsers. Considering shorter deadlines, agility and time to market it is humanly impossible to test applications to work on hundreds of such combinations as the number of supported versions add up. Automated cross browser compatibility testing is crucial to ensure the above goals are met. Cigniti’s cross browser accelerator has been developed with scalability and maintainability as the core focus areas. With web applications themselves supporting multiple browsers, screen resolutions and operating systems, there is no reason why the code that tests them should be any less adaptable. The accelerator uses Selenium under the hood, making the most of web driver’s capabilities and adding 100s of keywords and an intelligent routing architecture for browser-based acceleration. The routing architecture enables testers to write automation scripts once and run many times – with the same selenium script being executed on multiple combinations of browsers, devices, and operating systems. The accelerator provides reusable libraries to kick-start automation efforts and its architecture facilitates easier portability of scripts across environments. This helps automate and accelerate browser compatibility testing. The solution is integrated with a leading cloud-based solution for executing tests and scripts on combinations of OS/Platforms and Browsers. The tool supports tests to be run on 200+ browsers and platforms. 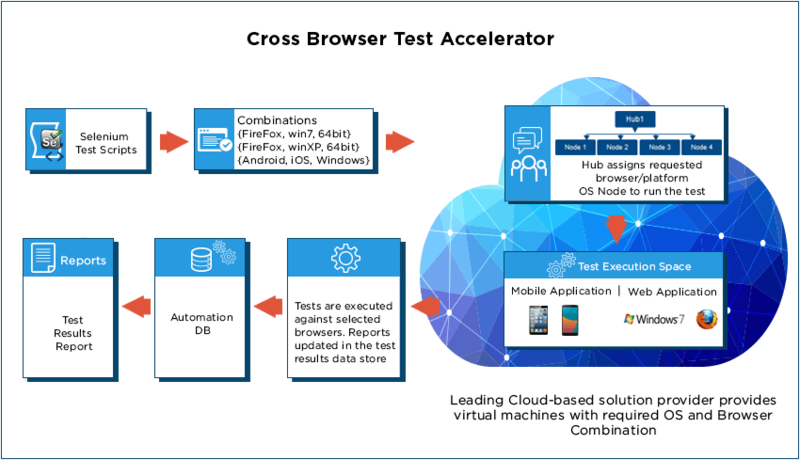 Cigniti’s cross browser test accelerator ensures that your mobile and web applications offer a consistent and pleasant experience across all combinations to your users. Cigniti’s browser compatibility test accelerator helps write automation scripts once and run many times allowing the same selenium script to be used for testing on multiple combinations of browsers, devices, and operating systems. The tool provides reusable libraries to kick-start automation efforts and its architecture facilitates easier portability of scripts across environments. This helps automate and accelerate browser compatibility testing. The solution is integrated with leading cloud-based solutions for executing tests and scripts on diverse combinations of OS/Platforms and Browsers. The tool supports tests to be run on 200+ latest browsers versions and platforms. Cigniti is a thought leader in the field of cross browser testing and also contributes to developing excellence in mobile testing by sharing experiences using blogs, webinars, white papers, etc. Cigniti’s strategic partnership with commercial and open source tool providers allows us to offer best in class cross browser testing services to our customers. This enables our clients to accelerate release of web applications into production and sustain continuous feedback and improvement across the test automation lifecycle by being more agile and responsive.